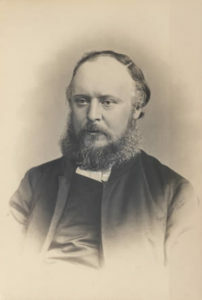 John Owen Picton descended from an old Welsh family, was (probably) educated at Dublin University, ordained a priest in 1848, and instituted as Rector of St Martin’s Church, Desford, in 1861. He was President of the Lit & Phil in 1860-61. Source: Caroline Wessel, 2010. The Club. pp.85-96 in Exchanging Ideas Dispassionately and without Animosity (Leicester); also Wessel, Caroline (1989) St Martin’s Church, Desford: an illustrated guide. Desford Local History Society. p.6.